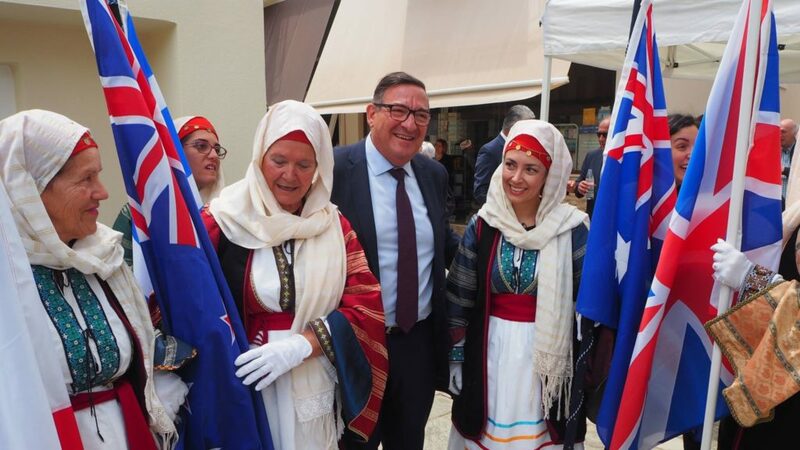 Steve Georganas MP with some of the traditionally dressed locals who held the national flags for the event at Methone. The sun shone on Pylos and Methone on 6 May as the crowd assembled for the historic unveiling of two WWII commemorative memorials. These commemorate two POW tragedies that affected the shores of the beautiful Messinian towns in the dark days of WWII. Over 800 Allied soldiers were killed when the Italian transport ships Sebastiano Veniero-Jason and Nino Bixio were torpedoed off the coast. Over 3,000 Allied prisoners survived the tragedies as the damaged ships were brought to shore, where they were helped by the local Greek population. In the early afternoon of 9 December 1941, an Italian troopship was sailing in heavy seas and a bitterly cold wind off the coast of Methone. She was the Sebastiano Veniero, a renamed Dutch transport ship formerly known as the Jantzen or Jason. She had begun her journey in Benghazi and was carrying 2,100 Allied prisoners of war who had been captured in North Africa. The troops came from Britain, South Africa, and New Zealand. Along with the POWs were a number of Italian troops. At precisely 2.35 pm a torpedo struck the hull of the ship. She was rocked by the explosion and lifted out of the water. Hatch covers and huge timbers were hurled into the air only to fall back into the holds of the ship, crushing the survivors who had been scrambling to get out as water rushed in. Some 500 or more prisoners in the hold of the ship were killed. Eight months later, in August 1942, the coastline witnessed another tragedy: the Nino Bixio. Bill Rudd was on this transport. Bill had been a young soldier with the Australian Engineers who had been captured during the Battle of El Alamein. Crammed aboard the Italian troopship with 2,000 other Allied POWs, Bill expected to be landed at Bari in Italy after the voyage across the Mediterranean. The prisoners came from many of the nations that had joined to oppose the Axis aggression in WWII, along with 200 other Australians, Bill was travelling with New Zealand, British, South African, and Free French Forces troops. The ship was also transporting Italian troops and war material. Unbeknown to Bill and the other prisoners onboard, British Royal Navy submarine HMS Turbulent was sailing the same waters on the western coast of Greece – dropping off supplies and Allied agents to support the Greek resistance and transporting andartes and Allied agents to Egypt. And so it was that at 4.33 pm on 17 August 1942, 12 nautical miles off the coast of Pylos, the Nino Bixio was rocked by the explosion of a torpedo from the Turbulent. Bill remembers a sudden thud as the torpedo burst into the hold. In the ensuing tragedy over 300 Allied prisoners were killed, many as they jumped into the sea seeking safety. One who died in this vain effort was a Scottish-born Australian soldier, Private James Paterson of the 2/28th Battalion. He would die of exhaustion after days adrift in the Mediterranean on a piece of wreckage. 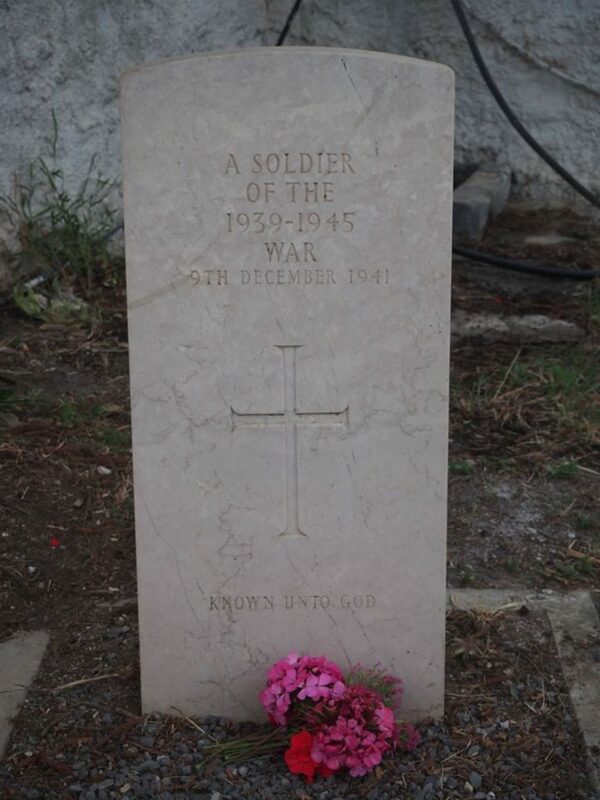 The body of another Allied soldier, a victim of the Sebastiano Veniero tragedy, was found on the shore near Romanos (north of Pylos) and buried in the local civil cemetery. Despite their damage, both vessels were brought to shore – the Sebastiano Veniero-Jason was beached on the rocks at Methone, and the Nino Bixio sailed into Pylos harbour. Records show that the survivors of both tragedies were assisted by locals providing food and clothing to the survivors. Survivors of the Nino Bixio, Bill Rudd included, helped remove the remains of the dead, who were initially buried in the local civilian cemetery, and later reburied post-war at Phaleron War Cemetery in Athens. Some locals were enlisted to remove the dead from the stricken Sebastiano Veniero-Jason and bodies washed that shore nearby, burying them locally, some in the grounds of Methone Castle, others near Aghia Sotira. Local resident Nick Georgopoulos, who had immigrated to Melbourne in Australia after the war vividly remembered collecting the bodies of the dead from the shore. Sadly, he has since passed away. The survivors were subsequently transported to POW camps in Italy. The grave of the unknown soldier, Romanos Civil Cemetery. Melbourne veteran Bill Rudd is most likely the last living survivor of these tragedies. Since I met Bill a number of years ago, he has often expressed the need to have the tragedies commemorated at Pylos and Methone. It has been my pleasure to work with Bill and Melbourne’s Papaflessas and Navarino Brotherhoods to bring this dream into a reality. In less than six months, both memorial plaques were written, produced and transported to Greece. The municipality of Pylos-Nestor has been a supporter of the project since we first raised it with them. Committing to erecting the plaques prominently at Pylos and Methone, the municipality not only installed the two new plaques, but also organised a beautiful commemorative service incorporating their unveiling. Over 100 people assembled at the Greek War Memorial at Pylos Harbour to take part in the unveiling service. 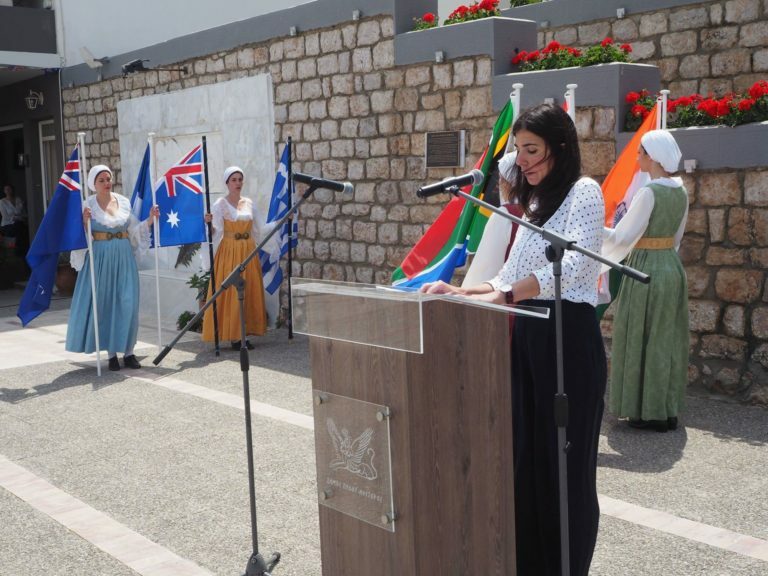 These included Lousi Kalfagian, representing the Australian Ambassador to Greece, Dimitiris Kantafaris, the mayor of Pylos-Nestor and Eleni Aleiferi, Vice-Regional Governor for the Messinian Region of the Peloponnese. Also attending were Steve Georganas, MP, representing the Australian Government, and John Pandazopoulos, former MP and Secretary-General of the World Hellenic Inter-Parliamentary Association. Australian Embassy representative Lousi Kalfagian addresses the assembly. Credit is due to the local authorities who conducted a full commemorative service. All flags of those prisoners represented on the ships concerned were flown, held by locals in traditional dress, national anthems played and readings made. It was my honour to address the crowd on behalf of the Memorial Organising Committee and to read an excerpt from Pericles’ Funeral Oration. Deb Stewart, the granddaughter of Lemnos nurse Evelyn Hutt, had the honour of reading the Ode of Remembrance. The plaque was unveiled jointly by myself, Ms Kalfagian, Mr Kantafaris and Ms Aleiferi. Many wreaths were laid in honour of those POWs that died, those who survived, and the locals who helped them, the first being laid by Australian representative, Ms Kalfagian. I was honoured to lay a wreath on behalf of the Melbourne Pylos Methone WWII Memorials Organising Committee. Among those laying wreaths were Magda Triantafilopoulou, Maria Grambas, and Lela Soublis, representing Melbourne’s Panpyliaki Brotherhood Navarino, the Pammessinian Brotherhood Papaflessas Australia, and the Pan-Australian Federation of Messinian Organisations respectively. The service was repeated at Methone, the memorial plaque unveiled at a lovely prominent site, visible as one enters the town. 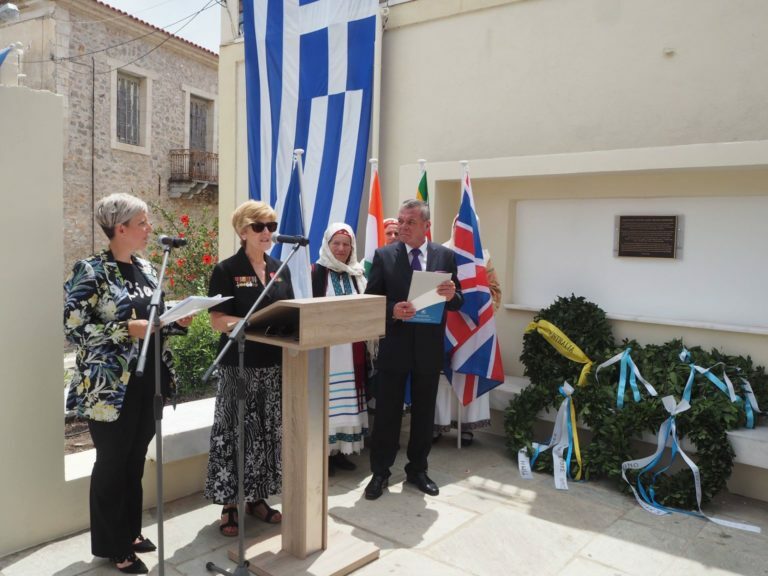 Recognising the British contingent affected by the tragedy at Methone, Janet Parkin, secretary of the British Greek Campaign Veterans Brotherhood read the ode and the Brotherhood’s Buster Beckett laid a wreath on behalf of the Memorial Organising Committee. The service at Methone was followed by my presentation on both tragedies at Methone’s Cultural Centre. I presented a prerecorded congratulatory message from Bill Rudd, produced by Paul Sougleris and Nikita Ballas. Those present were moved by Bill’s words and his thanks. The commemorative services ended with a lunch attended by dignitaries. Janet Parkin reads the Ode of Remembrance from Laurence Binyon’s poem For the Fallen at Methone. Mayor Kantafaris not only committed to holding annual services at both memorials but has announced his commitment to ensure that the region takes part in our proposal for a First and Second World War Anzac Heritage Trail across Greece, linking Lemnos, Salonika, through central Greece to the Peloponnese, and across the Aegean and Crete. In my addresses, I commended Melbourne’s Papaflessas and Navarino Brotherhood’s for their commitment to realising Bill Rudd’s dream. Without their support these memorials would not have been realised. And of course, Dimitiris Kafantaris, the mayor of Pylos-Nestor and his municipality, who have been unwavering in their support. On a personal note, I would like to thank George Iliopoulos, Paul Sougleris, John Mitsakos, George Saratsiotis, Rita L’Ambrosia, Nikita Ballas and all at Papaflessas and Navarino for their active support for this important Australian Greek heritage project. And thanks to Eleni Kazani and Helen BD from the municipality for their work in putting together a great event. 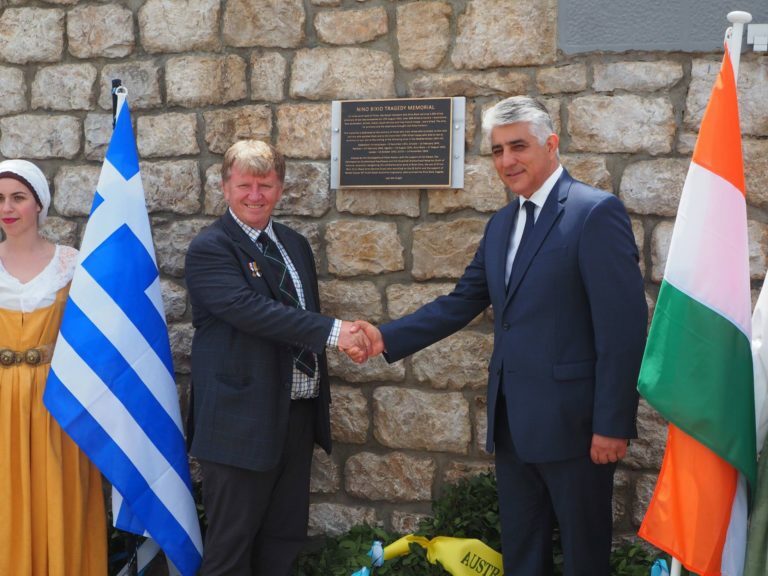 I look forward to working with the municipality of Pylos-Nestor and others across Greece, along with supporting organisations in Australia, to build Greece’s Anzac Heritage Trail, incorporating locations connected with both world wars. This trail aims to link existing memorials, erect new ones and assist commemorative visitors following Greece’s WWII and Anzac trail. And thereby we hope to assist Greece and its people by boosting tourism visitation. Jim Claven and the mayor of Pylos, Dimitiris Kantafaris following the unveiling of the Ninio Bixio Tragedy Memorial at Pylos. * Jim Claven is a freelance writer, trained historian and member of the Battle of Crete and Greece Commemorative Council. He visited Pylos and Methone with the support of Melbourne’s Papaflessas and Navarino Brotherhoods.